Made up of the finest local musicians, Spotlight Brass is the quintessential performance ensemble that excites audiences of all ages with humor, great music, and a passion for playing. Audiences love when Spotlight Brass serenades them with amazing renditions of their favorite music during festivals, celebrations, civic ceremonies, family and class reunions, and corporate events. Spotlight Brass was founded in 2010 by Lisa Lahmeyer and Brad Poreda. They envisioned a brass ensemble capable of playing big-band jazz, broadway favorites and other American classics, with a distinctively brass sound. They designed an ensemble big enough to carry the full, luscious chords of jazz but still be small enough to offer an intimate listening experience for their audiences. The result was nothing short of amazing. After playing a few early gigs, both the players and audiences knew that Spotlight Brass was something special. With the ability to cover a wide range of popular music while delivering an up-close and personal performance, Spotlight Brass blossomed into a must-have ensemble for local corporate events, festivals, and senior communities. In 2013, after 3 years of delighting audiences, co-founder Brad Poreda followed his heart and moved to Indianapolis, the center of the band and drum corps world (and where the love of his life, Lesa, lives), and formed the Indy edition of Spotlight Brass. Twice the audiences, twice the fun! Spotlight Brass is composed of talented local Tulsa and Indianapolis musicians with deep roots in their community. Three trumpets, two flugelhorns, two trombones, a euphonium, a tuba and a percussionist comprise the core group. This 10-piece instrumentation makes Spotlight Brass unique compared to the more common quartet and quintet ensembles. All members within the group share responsibility for not only critiquing one another and elevating each other’s level of play, but they also share in all aspects of the planning, marketing and performance logistics. Jazz and Broadway classics make up the core repertoire of Spotlight Brass, but Latin, Rock and Folk hits are in there as well. They play music that audiences love to listen to, with a fresh and exciting blend. Because of the unique instrumentation, most of the music is custom arranged for Spotlight Brass by Brad Poreda. An experienced and accomplished arranger, he allows each instrument and section to shine while establishing a cohesive and recognizable sound for the group. Spotlight Brass play at numerous venues in the Tulsa and Indianapolis area, from corporate events, to civic ceremonies, local celebrations, festivals, and senior communities. Their 1-hour music sets are filled with variety, virtuosity, nostalgia and humor. They offer reasonable rates and will work with their hosts to customize a playlist and performance to fit just about any audience and occasion. Trumpet: A familiar instrument to most Americans, the trumpet is capable of a bright, brilliant sound and typically provides the higher, main voice in large bands and ensembles. 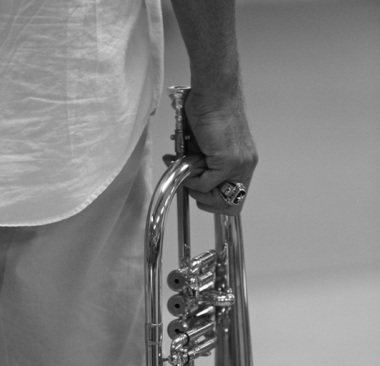 The bright, brassy sound makes the trumpet a natural instrument for many types of jazz. Flugelhorn: Not as familiar to most people as its cousin the trumpet, the flugelhorn is similar, but with a wider, conical bore, giving it a darker, mellower sound. It is becoming increasingly popular in jazz ensembles and bands here in America. Trombone: Another familiar instrument to most Americans, the trombone is a brass instrument utilizing a slide instead of valves. Capable of providing the mid level to low voice of the ensemble, the trombone has long been a staple of jazz bands as well as symphonic orchestras. Euphonium: Sometimes called a baritone in the US, the euphonium is a smaller member of the tuba family. With a conical bore similar to the flugelhorn and tuba, the euphonium provides a deep, rich, mellow tone in the mid to low range. Used mostly in wind bands (as opposed to symphony orchestras) the euphonium is seeing an increasing in popularity as a solo and even a jazz instrument. Tuba: The low, deep voice of the ensemble, the tuba has a long history of providing the musical foundation of a wide variety of musical groups. It is versatile enough to play, not only the bass line of any song, but solos and melodies as well. Drums: Spotlight uses a traditional trap set with snare, bass drum, cymbals, toms and occasionally other odd and interesting instruments. This is the typical set up seen in most jazz, country and rock bands.